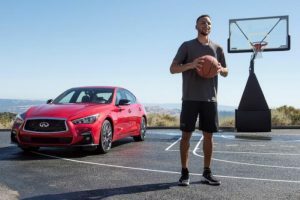 Nissan Motor Co., the Japanese automaker announced that Infiniti its premium brand has entered into a marketing agreement with Stephen Curry a star with the NBA Champion Golden State Warriors. During his first year in the marketing campaign, the Warriors’ point guard will feature in different advertisements for the Infiniti Q50, the redesigned flagship sports sedan that is due to launch across the globe during August, said the automaker’s prepared statement. The campaign includes television advertising and will roll out across the U.S., China as well as other markets that will coincide with the Q50’s launch. Nissan will publicly announce the marketing deal on Wednesday. Roland Krueger the head of Infiniti said through a prepared statement that the U.S. is the vehicle’s largest market and China its biggest growth market therefore partnering with Curry is an excellent way to reach the consumer across the globe. Curry and his Golden State teammates have won two of the past three NBA Championships. He won the NBA MVP award in the 2015 and 2016 seasons, has been an All-Star four times and led the league in scoring in 2016. The Associated Press named Curry the 2016 Male Athlete of the Year. In China, Infiniti trails the three top premium brands from Germany Audi, BMW and Mercedes Benz, along with its rival in Japan Lexus, which is expected to launch a new sedan with a long wheel base. Last year, Infiniti sold over 76,000 of its Q50 globally, with 44,000 sold in the U.S. and 19,000 in China. Curry will be given the title of global brand ambassador by Nissan. Through a prepared statement, Curry said Infiniti was a brand he has known as well as admired due to its strong heritage of design, performance and cutting edge technologies. He added that he was drawn to the brand value and the passion for the craft put into its manufacturing. Infiniti’s Melissa Bell the head of the automaker’s global marketing said the company was excited to be partnering with Curry, She added that both the company and Curry share a common mindset, dedication and passion and she looked forward to working with him and having him become part of the Infiniti family. With the NBA season just completed, Curry will have additional time to work with Infiniti in preparing for the launch of the redesigned Q50.